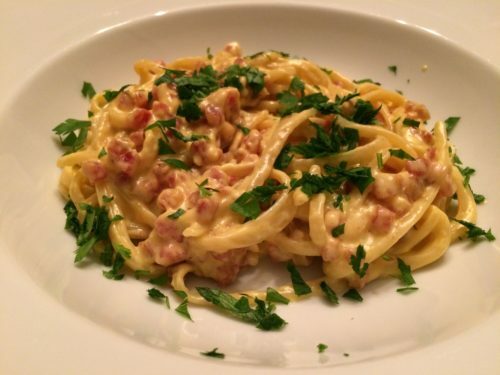 The Best Pasta Carbonara Recipe. Let’s face it. Decadent Pasta Carbonara is not a particularly healthy dish. 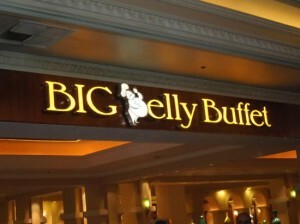 But once in a while…it’s sooooo good! 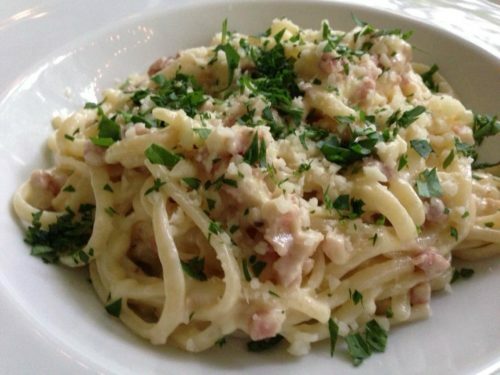 Eaten in moderation, rich Pasta Carbonara can still be enjoyed a few times per year. Add a glass of red wine to help counteract all that fat (according to the French)! 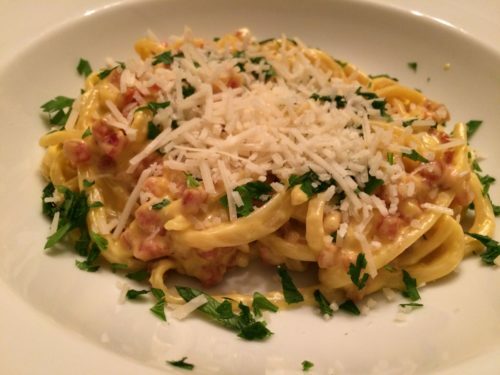 My husband’s recipe is The Best Pasta Carbonara Recipe — ever. 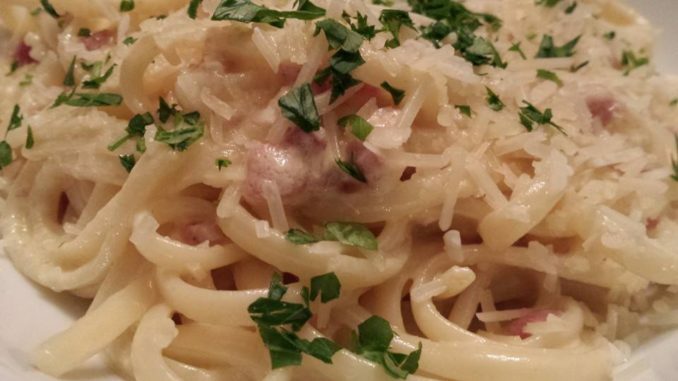 The traditional Carbonara recipe from Italy doesn’t include cream. The traditional recipe is usually just cooked pasta mixed with raw eggs, bacon or ham, grated hard cheese and cracked black pepper. Other variations can include adding heavy cream or fresh garlic to the dish. 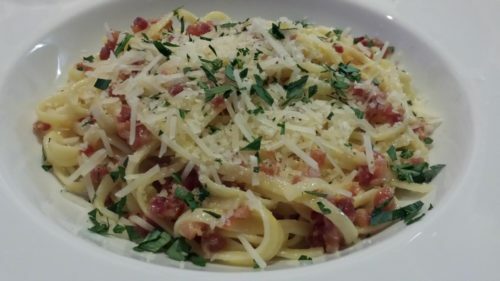 My husband uses cubed pancetta and adds cream and garlic to his recipe. This pasta dish is a fairly quick meal on a weeknight. Turn it into a pasta course in a multi-course meal on a weekend and your guests will rave. We use Citterio cubed pancetta in this recipe. It’s already cubed so you just open the package and pour it into your skillet. 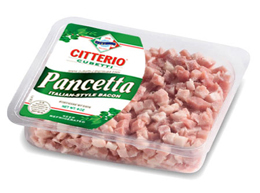 Trader Joe’s, Costco, and most grocery stores carry Citterio cubed pancetta. How to start? Cook some fettuccine, linguine, or spaghetti in boiling water until al dente. While the pasta is cooking, saute some cubed pancetta in skillet. You don’t need butter or olive oil as the pancetta will cook in its own fat. Remove the cooked pancetta from the skillet and set aside to keep warm. In the same skillet in the remaining fat from the pancetta, lightly saute the garlic but don’t let it burn. Drain the cooked pasta when it is done. Add the drained pasta to the skillet with the cooked garlic. Over very low heat, stir in the cream and the egg yolks. Toss the pasta with tongs to coat the pasta evenly with the creamy egg mixture. Stir in the cooked pancetta and a small amount of shredded Parmesan cheese. Warm through. Plate the pasta using the tongs. Season the pasta to taste with cracked black pepper. Garnish with more shredded cheese and minced fresh Italian parsley. And serve! 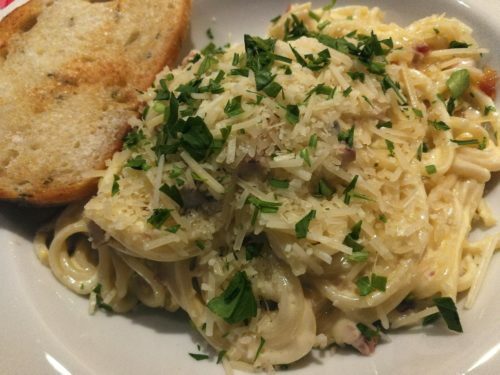 Hubby’s Pasta Carbonara is an elegant main course or pasta course for your holiday dinner party — and it’s just as delicious all year round! Offer with some crusty garlic bread and a side salad. 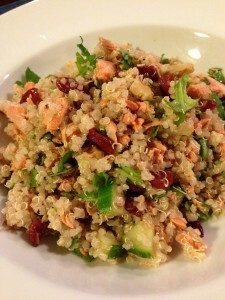 You can serve a red wine or a white wine or a sparkling wine with this dish. 1. In a large pot, cook the pasta according to package directions. 2. While the pasta is cooking, saute the pancetta in a skillet over medium low heat. 3. When the pancetta has cooked (it will be crispier), remove it to a bowl and keep warm. Do not drain the remaining fat from the skillet. 4. Saute the garlic in the skillet in the pancetta’s fat for a minute or so. 5. When the pasta is done, drain it and add it to the skillet. 6. Over very low heat, stir in the egg yolks and the heavy cream, tossing until the pasta is evenly coated. 7. Return the pancetta to the skillet with the pasta, add 1/4 cup of shredded Parmesan cheese, and toss the pasta and warm through. 8. Plate the pasta on serving plates. 9. Add cracked black pepper, to taste, and garnish with the minced parsley and remaining shredded Parmesan cheese. Serves 4 as a main course or 6 as a pasta course. Offer with red wine or a dry white wine or even a sparkling wine. If serving as a main course, offer a field greens salad on the side. Variations: Omit the cream, egg yolks, and parsley for a more traditional recipe. Add cooked sliced mushrooms and peas for a different flavor. Use regular diced bacon or pork belly if you can’t find pancetta. Use your favorite pasta including penne, rotini, cavatappi, fettuccine, etc.